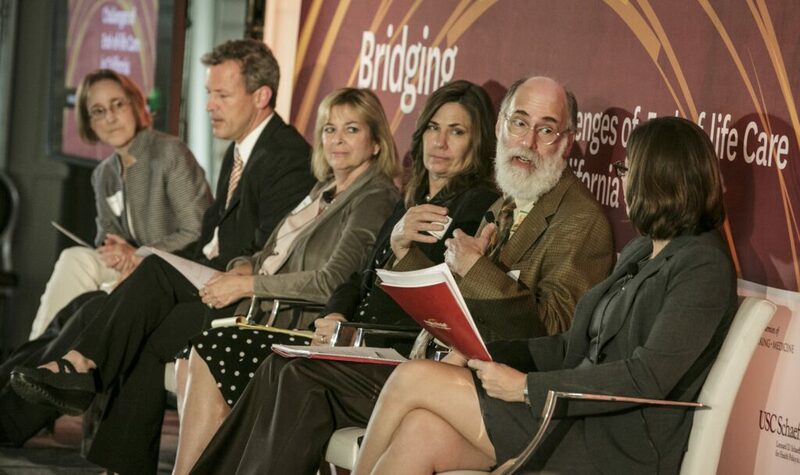 While California is a national leader in improving end-of-life care, a fragmented health system and perverse financial incentives are major challenges to getting patients the care they need and desire, a conference of top healthcare experts concluded. 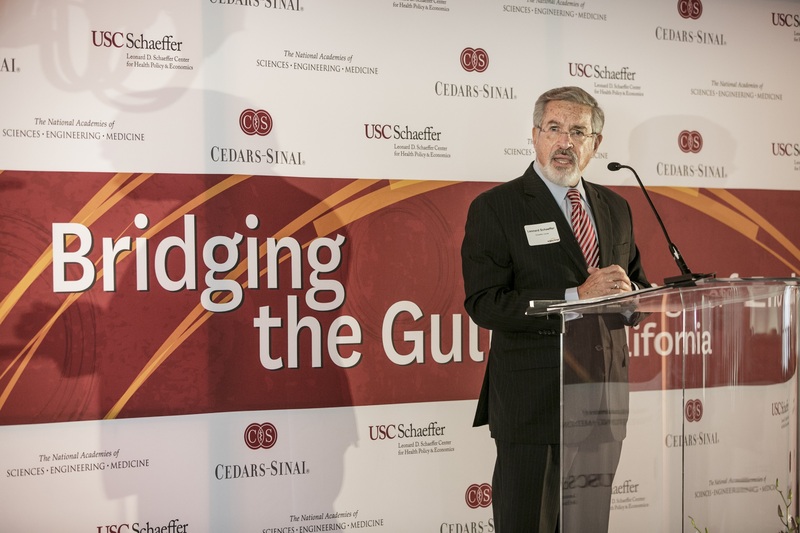 The Nov. 7 conference in Beverly Hills—Bridging the Gulf: Challenges of End of Life Care in California– was hosted by the USC Schaeffer Center for Health Policy & Economics, The National Academies of Sciences, Engineering and Medicine, and Cedars-Sinai. It was supported by Anthem BlueCross and the Gordon and Betty Moore Foundation. Conference participants were divided over who should take the lead in driving change for end-of-life care. In a snap poll conducted by Arthur Stone, director of the USC Dornsife Center for Self-Report Research and affiliated faculty member at the Schaeffer Center, the same number of attendees favored clinicians as those favored patients and families. Elizabeth Bailey, a patient advocate and author of The Patient’s Checklist, recounted the experience of her late father as an example of how the healthcare system can swallow up patients and families and create great financial strain. After her father fell at home and was taken to an emergency room, he began an odyssey of treatments under various specialists with no central direction. Bailey used her negotiating skills as a former music video producer to try to manage his case. She said she finally achieved the care that was needed for both her father and the family when she got him admitted into a Veterans Administration palliative care unit. “Moments of grace multiplied,” she said. For her father, dying at home was not an option given the care he needed. Arriving at the right place “is about talking in plain language,” she said. Philip A. Pizzo, professor of medicine at Stanford and co-chair of the Institute of Medicine Committee on Approaching Death, noted that the public discussion of end-of-life issues had made significant progress in the past seven years. “Remember death panels?” he said, referring to the fear that government encouragement of end-of-life discussions would push patients to premature deaths. Now, Medicare is able to reimburse physicians for holding end of life consultations with patients. Yet, too much care is still driven by fee-for-service decisions which results in too many providers and uncoordinated care at the end, Pizzo said. “We need a seamless, accessible healthcare system” that can provide alternatives to the emergency room, where “all bets are off,” he said. A major impediment to providers is uneven directions from patients, who are not filling out advance directives in a timely manner. Fewer patients are dying in hospitals and more are under hospice care, but still only 36 percent of patients are involved in their final care decisions, according to Dana Goldman, director of the Schaeffer Center. Attendees returned repeatedly to the centrality of advanced care directives as the starting point for better end-of-life care. Pam Kehaly, president of the West Region and Specialty Businesses for Anthem, said the insurer is identifying clients likely to be in need of end-of-life care and offering to help get them counseling for a directive. Several other experts stressed that the directives can be confusing, may be asking the wrong questions, and can lead to distrust during a panel discussion moderated by Anna Gorman, a senior writer for Kaiser Health News. “We need to ask patients what matters to them, and how much [medical treatment] will you tolerate to get there?” said Stuart Finder, director of the Center for Healthcare Ethics at Cedars Sinai. Janet Corrigan, chief program officer for Patient Care at the Moore Foundation, agreed that better definitions are needed for directives as a way to design policies that meet patient values. Payment models are misaligned, she said, and still favor fee-for-service for end-of-life services even in Medicare Advantage programs. “Congressional action is needed,” she said. The day-long conference was held at the SLS Hotel in Beverly Hills and attended by over 110 health experts and professionals.